Remove the front door outside handle. 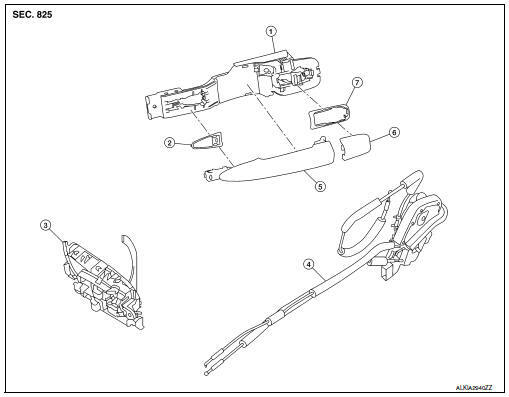 Refer to DLK-173, "FRONT DOOR HANDLE : Removal and Installation - Outside Handle". Remove the rear glass run. Disconnect the harness connector from the front door lock actuator. Remove screws, and the door lock assembly. Tighten front door lock screws to specified torque. Do not reuse front door lock assembly screws. Always replace screws with new ones when removed. Check front door lock cables are properly engaged to inside handle and outside handle bracket. When installing door key cylinder rod on the LH front door, be sure to rotate door key cylinder rod holder until a click is felt. Check front door lock assembly for poor lubrication. If necessary apply a suitable multi-purpose grease. Remove the rear door outside handle. Refer to DLK-176, "REAR DOOR HANDLE : Removal and Installation - Outside Handle". 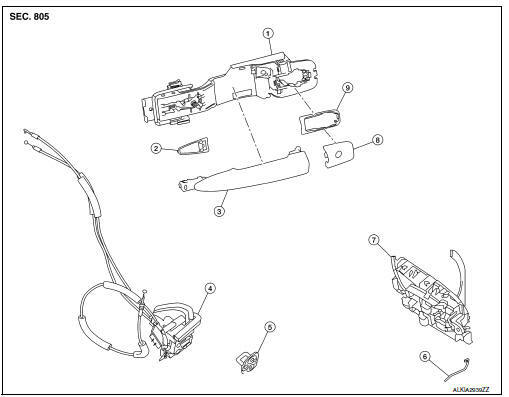 Disconnect the harness connector from the rear door lock actuator. Tighten rear door lock screws to specified torque. Do not reuse rear door lock assembly screws. Always replace screws with new ones when removed. Check rear door lock cables are properly engaged to inside handle and outside handle bracket. After installation, check rear door open/close, lock/unlock operation. Check rear door lock assembly for poor lubrication. If necessary apply a suitable multi-purpose grease.